If you’re planning your first bonefish adventure it’s really important that you stock your saltwater fly box with a well rounded selection of fly patterns. Although bonefish aren’t known for being super selective feeders, stocking the right flies and knowing which pattern to fish in different situations can make a big difference in your success on the water. By far the most important element in bonefishing is fly presentation. Without that, you’re going to miss a lot of shots. Putting that aspect aside with the notion that you understand basic bonefish presentation, let’s talk about some tips for purchasing and tying bonefish flies for your upcoming bonefish trip. 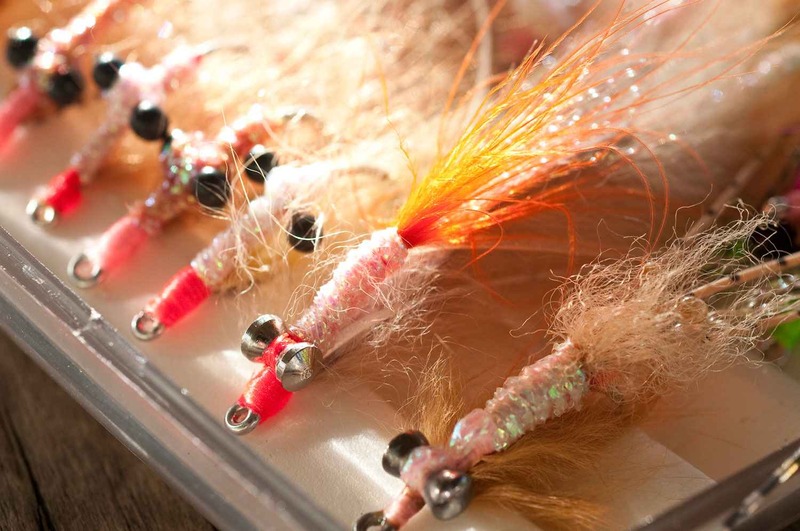 This entry was posted in Saltwater Fly Fishing and tagged 4 Tips For Stocking Bonefish Flies, bonefish flies, bonefish fly patterns, fly fishing blog, fly fishing bonefish, fly fishing flies, Gink & Gasoline, Gink and Gasoline, Kent Klewein, Louis Cahill, Saltwater Fly Fishing by Kent Klewein. Bookmark the permalink. great post. i’ve always wondered how many flies of each pattern i should bring, especially when wading. not that much storage space in a waist pack. Great Point, I can’t believe I forgot to add that into the post. Thanks for recommending that. I’m going to add it per your comment. Spend extra for good hooks if you tie your own. On bones of 6.5 pounds and up, I routinely see flies gapping open at the bend, changing the angle of the hook set, creating a “Palm Beach Release”; another mistake with some less expensive hooks are when the bonefish catches the fly just the right way in its throat crushers, “dink”, broken hook right at the bend in the shank. (Like a walnut in a nutcracker. (Sometimes it is an inferior hook, sometimes it is a hook that has been “closed” after it came back “gapped”; third problem, not rinsing your salted flies and drying them properly leads to corrosion under the body wrapping, again resulting in a broken hook when a decent bone puts it under real pressure. Thanks for bringing that up. I’ve burned that into my brain forever and its easy sometimes to overlook something as simple a using quality hooks in saltwater. I had a good friend and guide tell me once the dumbest thing you can do is penny pich when it comes to hooks. Its the single most important connection between the angler and fish. Thanks for your comment and bringing up this critical point. How about a tying video with some of these. Thanks. Here are a couple tying videos of bonefish fly videos on the blog currently by Bruce Chard that you can check out. What do you consider top hooks? Gamakatsu or owner are my first two choices.